XENIA — David A. Smith, was honored at the 80th annual convention of Symposiarchs of America held recently in Frankfort, Ind. 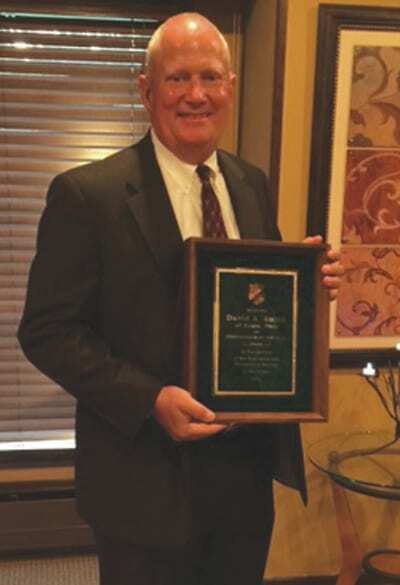 Named Symposiarch of the year, he was honored by the national organization for his outstanding activity for the Xenia Chapter of Symposiarchs during his membership and also his service to his community and his university. The award is the highest honor made by the organization to an individual. A certified financial planner of Smith, Moses and Company, LLC, in Beavercreek, it was noted that Smith has been an active member of the Xenia Symposiarch chapter for more than 20 years and contributed much to its on-going success having served as president and treasurer. He was nominated by his local chapter. Symposiarchs of America is a national organization of college fraternity men located in 12 chapters in Ohio, Indiana, and West Virginia.